Mabal is the Blaan term for the abaca weaving process. 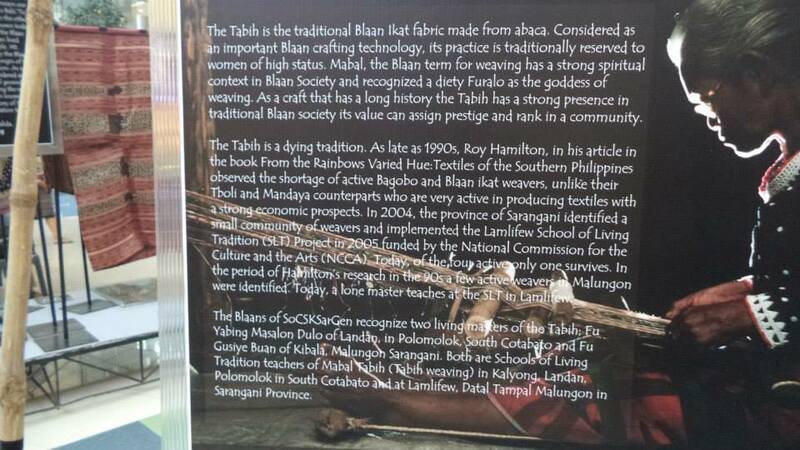 Tabih is the term for the finished hand woven cloth and it also refers to the traditional Blaan tubular skirt. Natural dyes from endemic plant species in the community are the source of colors for different designs of this indigenous textile. Fu Yabing Masalon Dulo is the first Mabal Tabih Cultural Master that was hired for the NCCA funded School of Living Tradition (SLT) Project implemented in 2005 at Lamlifew. She now runs her own Mabal Tabih SLT in Kalyong, Landan, Polomolok, South Cotabato. Visit her website and FB Page. Fu Gusiye Buan started as the Mabal Tabih Cultural Master for Lamlifew in 2014. She is originally from Kibala, Malungon. Click photo link for the advocacy on Fu Yabing and Fu Gusiye as potential nominees for the Gawad sa Manlilikha ng Bayan (GAMABA) or the National Living Treasures Award. Photo by Jocelyn Robles.